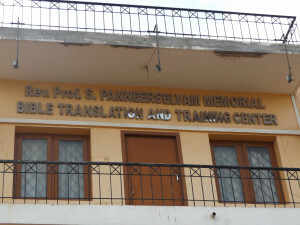 In 1978 Prof S. Paneer Selvam (Jabez’s father = the father-in-law of Sharmilla’s sister) had the amazing vision to start Indian Bible Translators. He was struck that, although he could speak English fluently, he was only fully comfortable reading a Tamil Bible. He became convinced that every person had a right to worship God in their own ‘heart language’. Challenged by the experience of William Cameron Townsend, the founder of the Wycliffe Bible Translators, Mr Selvam felt called to start IBT: Townsend was in South America trying to sell a local a Spanish Bible. The man asked him in broken trade Spanish if he had a Bible in his own language, which was the Cakchiquel language. The wonder of Pentecost, in Acts 2, is that God does speak my language. And so, even though Mr Selvam died in 2013, the work of IBT goes on. 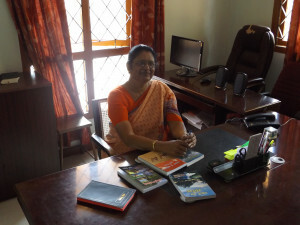 I heard stories of translations being worked on all over India. Mr Selvam’s vision was to complete the Bible in 200 Indian languages. What is so encouraging is that this is no purely academic exercise. I spoke at a prayer meeting where we heard of baptisms, new churches and schools. An amazing work, and all out of Coimbatore. As I continue to make my way through the book “Turning the tables on mission” I have been thinking about that quote from Townsend. What does it mean at RLBC that God speaks my language? Some of the writers recount the hostile reaction they first received when they came to the UK – Brits complaining that they couldn’t understand their thick Brazilian/Nigerian/Indian accent. The sinful human heart tends to put ‘me’ at the centre of the Bible story. And so when I discover that God speaks my language I assume this means that everybody should speak to me in my language. However, the gospel turns this upside down. The incarnation shows that God takes the initiative. This means that I want to speak to everyone else in their language. Now, what does this mean in a church (or any community) where it is not possible to speak all languages at once? Very simply it means that all communication is a two-way process. When we arrive at church we come with the attitude that I am going to work hard at listening to others who are not native speakers of my language and also I will try my best to speak in ways that others (especially from different cultures) find easy to understand. I have traveled a few times to Nilgiri Hills (Blue Mountains) when we were in India but never had the opportunity to observe so much! Hope you haven’t missed the tea-estates! Thank you Joseph – I am only able to observe so much because of the kindness of your relatives!